This big, beautiful bovine isn’t the world’s largest, and she doesn’t even have a name. But we still love her, because she welcomed us to the Turkey Hill Experience in Colombia, PA! They’re not excited at ALL. Where we went, and who was coerced into going? 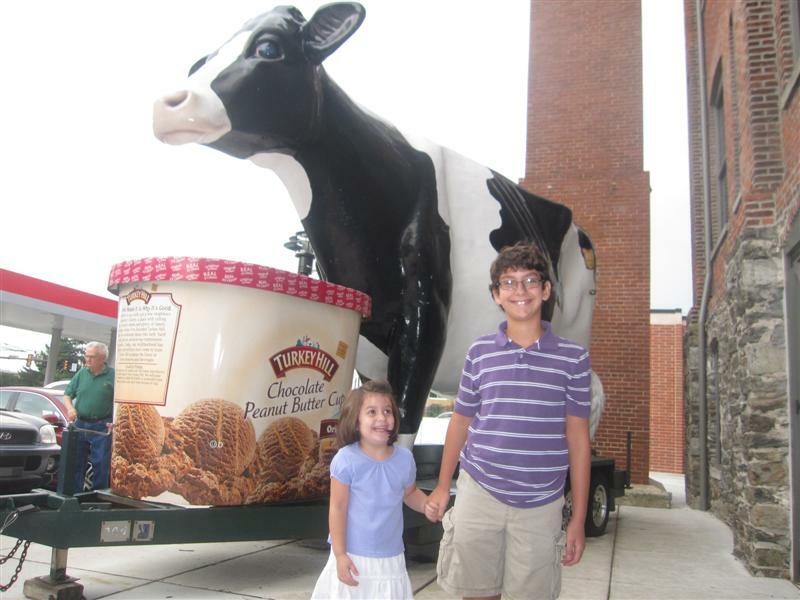 Heading to Pennsylvania Dutch Country was a “last hurrah” getaway before school started. I told the kids, “we’re going to learn how ice cream and potato chips are made, and then we get to eat them.” Not a tough sell. The Turkey Hill Experience was the last stop on a three-day tour of the “snack food corridor” connecting York, Lancaster, and Chester counties. We toured potato chip and pretzel factories, visited chocolate makers, and searched for whoopie pies. Both York and Lancaster counties have their own “sweet and salty” tour itineraries listing all the companies offering public tours and/or outlet shopping. We visited nine of them! Even after gorging ourselves on all that, there was still room for ice cream! 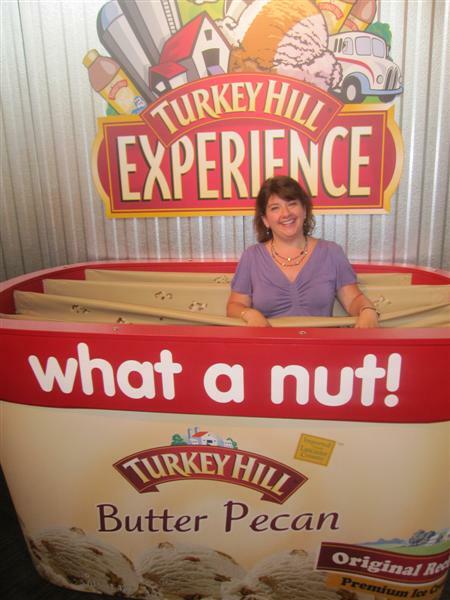 What you should know is that the Turkey Hill Experience is not a factory tour. Although if you care to watch, there are video monitors which show the actual Turkey Hill Dairy production line. But you’ll likely be distracted by all the kid-focused exhibits. This place is more like a children’s museum. Highly interactive activities represent the progressive stages of ice cream production, while teaching concepts like homogenization (via the ball pit!) and pasteurization. Some activities are just plain fun, like milking the mechanical cows, sitting in the milk truck, standing in the blast freezer, and creating your own ice cream flavor. This was definitely The Boy’s favorite experience. He created a flavor called Chocolate Browny (The chocolate gene is one of a select few he inherited from me). The day "Chocolate Browny" was born. 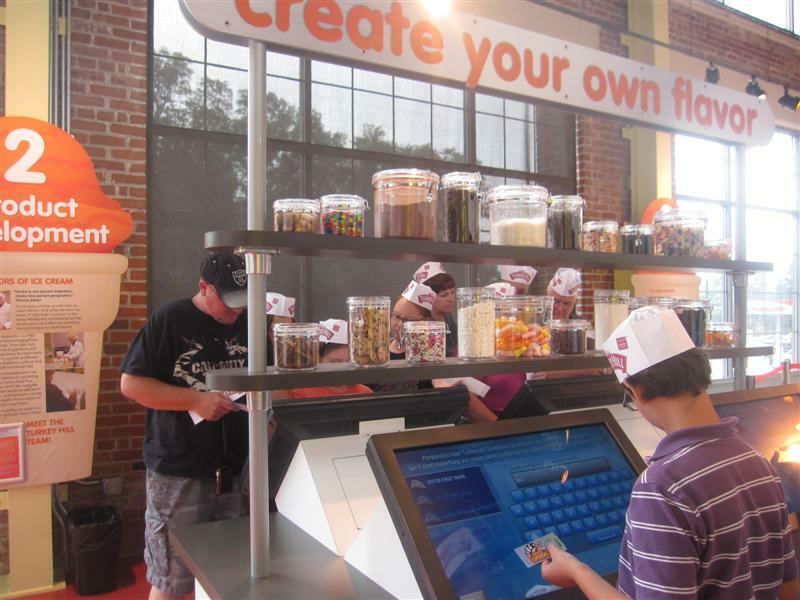 On a touch-screen computer, he selected from a choice of ingredients: a chocolate mix ice cream with vanilla and a swirl of fudge, loaded with brownies. He then created simulated packaging, which was saved under his profile. When he went to film a commercial, his packaging appeared on the screen, along with a teleprompted script. We emailed the commercial to our email address to view it when we got home. Of course, there were samples! First we tried different flavors of iced teas (Green Tea Mango – YUM!). Then we each got a generous ice cream scoop from a choice of five flavors, which changes daily. 75% of the Go BIG family went for the Blitzburgh Crunch, a flavor created in honor of the Pittsburgh Steelers (vanilla with peanut butter and chocolate chunks). The other 25% picked her go-to stand by, chocolate. Not surprisingly, one scoop just wasn’t enough for us. We stopped at the Creamery Café on the bottom floor next to the gift shop, ordered a cup of the whoopie pie flavor and another of chocolate. Mind you, all this ice-cream-eatin’ occurred before 11AM. The menu also includes salads and sandwiches, but at that point, we were really and truly FULL. I was ready to go home to a week of veggies and lean proteins! The Turkey Hill Experience is a truly entertaining family vacation attraction which rates an 8.5!The only downside is the relatively remote location; you’re not going to just happen upon the place. 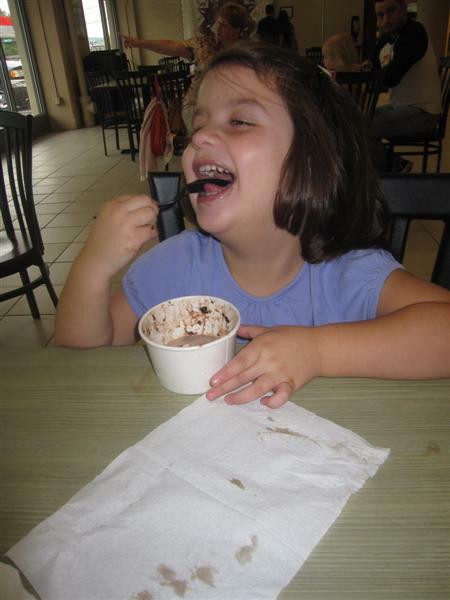 But when added to a “sweet and salty” itinerary, it’s a FUN trip for kids of all ages.